I started gardening just two years ago and fell in love with fresh-picked organic carrots. Because my harvest of carrots this fall was so humungous (hundreds of carrots), I had to become inventive! I developed this recipe, which has been given two thumbs up by my three-year old. It would make a lovely holiday meal side dish! I hope you enjoy it as much as I do! reduce heat. Cover and simmer 5 minutes. Add pineapple, apple, cranberries, honey, lemon juice, and salt. Cook 3-4 minutes or until carrots are crisp-tender, stirring occasionally. Combine coconut oil, flour, and cinnamon; stir into pan. Bring to a boil; cook and stir 2 minutes or until sauce is thickened. Sprinkle with walnuts before serving. People may think that an epicurean and a health food enthusiast are at opposite ends of the spectrum, but I consider myself both. An epicurean is said to have luxurious tastes in eating and drinking, while a health food enthusiast is often stereotyped as a crunchy-granola hippie type. I create gourmet healthy meals by sourcing my ingredients from my garden and farmer’s markets and then carefully preparing scrumptious meals. Sadly though, with a toddler in tow, I often do not have the time! I’m happy to report that I can get the high-quality, delicious, locally-sourced healthy food I desire in prepared meal containers right here at Natur-Tyme every day without hurting my pocketbook! 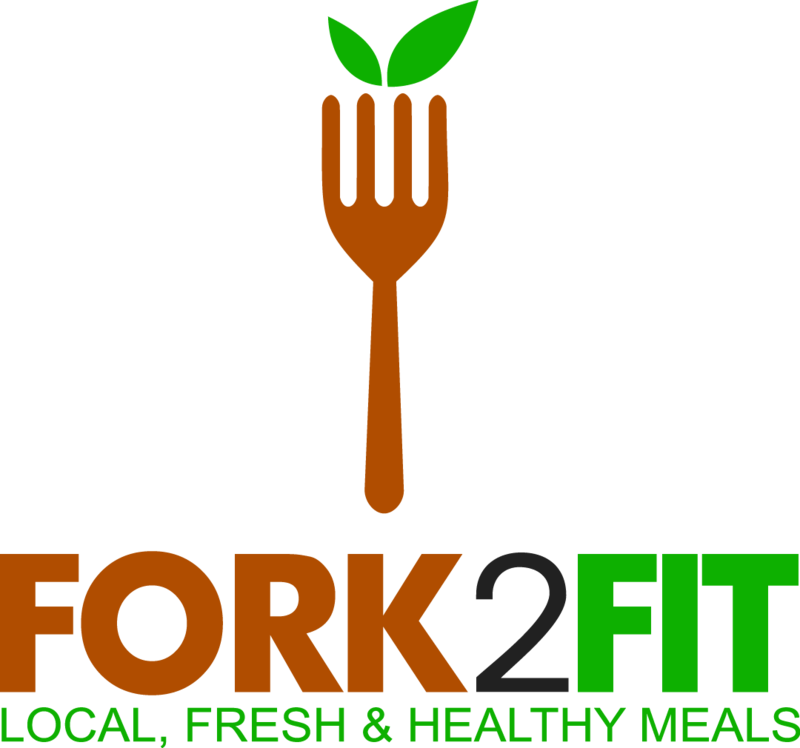 We now carry Fork2fit! Fork2fit meals are chef-prepared right here in CNY; they are fresh, high-quality, bursting with flavor, healthy, and energizing. Their meal choices rotate twice a week. Some customer favorites include: Southwest Turkey Stir-Fry, Meatloaf with Cauliflower Mash, and Chicken Fajitas. Natur-Tyme sells some organic options as well and we are the exclusive providers of vegan and vegetarian Fork2fit meal options such as the Vegetarian Mushroom Caprese and the Vegan Winter Squash Risotto that customers rave about. I have loved every Fork2fit meal I’ve tried and I bet you will too! The best part of all is that these meals are affordable; they range from $6.99 to $11.49 a meal. Come pick up a meal; it’s like having a personal chef! Learn more about Fork2fit on our website. Wash and then chop the cruciferous vegetables of your choice into bite size pieces. Add the remaining ingredients. If you do not like certain ingredients, leave them out. If you like certain ingredients, add more of them. Add the dressing one hour before serving. You can always make more dressing and use it at a later time. Be creative with this salad and enjoy! Here’s a neat twist on a traditional lentil salad. 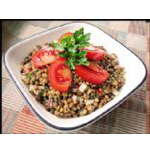 This one uses sprouted lentils instead of cooked ones for added nutrition and outstanding taste! Mix dressing ingredients well. Set aside. In a bowl, toss together salad ingredients. Feel free to toss in some feta or kalamata olives, too! Drizzle dressing over the top and serve! * You can sprout lentils by soaking them in a glass jar of water for 8-10 hours. 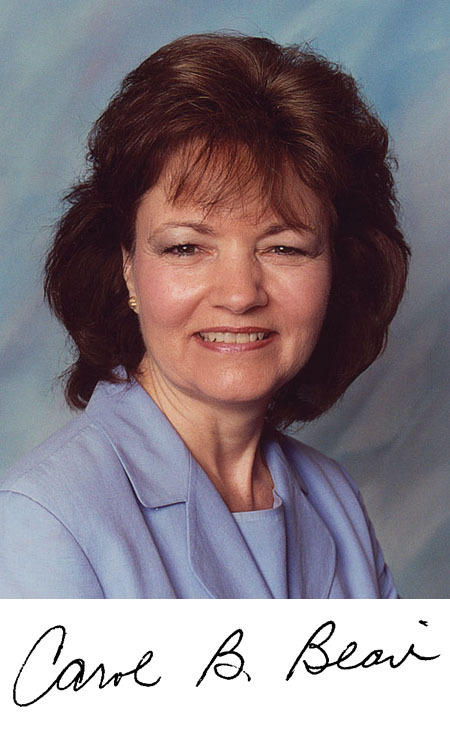 By Guest Blogger Tina McPherson, Primo and Mary’s Heritage Products, Inc.
Wash, clean and remove eyes and blemishes from the potato or potatoes you desire to bake. Potatoes may be baked in the microwave oven as a time saving measure, but they can also be baked in a conventional oven at 350 degrees F.
Before baking, punch a few holes with a knife in each potato, making sure that the knife penetrates at least half way through the potato. This allows the steam to escape. Bake the potatoes until tender. Serve the potatoes hot, split lengthwise and crosswise about 3/4 of the way through, and then with both hands, squeeze the four corner of the potato quickly (to avoid burning your finger tips), so that the top splays out. 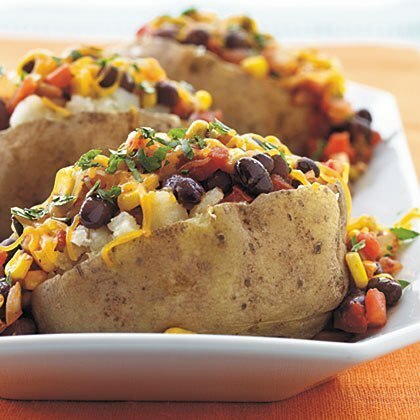 Fill the open part of the potato with Primo and Mary’s Black Bean and Corn Salsa. Cheese and scallion are optional. As spring appears, we think of flowers, green lawns, cleaning up the winter debris, gardening, and maybe composting? This is an excellent time to start a compost pile if you haven’t already. By returning nutrients to the earth, you improve your garden by producing healthier soil with more minerals. Like a healthy body that requires fewer prescriptions, healthy soil nourishes the plants so they require fewer pesticides. If you don’t have a garden, this is a good time to think about growing a few vegetables or fruits. If you don’t want a full-fledged garden, containers can house tomatoes, green or red peppers, or even a few strawberries. 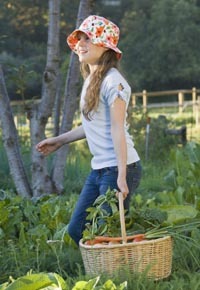 This is a wonderful way to get the kids to eat healthier as they are always so proud of food they grow themselves! It’s also nice to be able to share a couple of fresh, organic tomatoes with a favorite neighbor or perhaps even get a few neighbors to try growing different varieties. Then you can share to see which tomatoes you like best. You might even like the results of getting to know your neighbors better. And what’s nicer than having a few fresh herbs like chives and parsley growing on your deck? Have you ever thought about planting a fruit? With the prices of food rising so dramatically and no relief in sight, this might be the time. There are many dwarf varieties available as well. Get some advice as some might need a “partner” tree for pollination. It’s spring, one of my favorite times of the years, so let’s start composting, growing, and developing a sense of community. After heavy holiday meals, you may be craving something light! Here’s a delicious option! This may be used for any meal. I often eat it for lunch but it is also great for a brunch. Because it is basically raw, it is easy to digest. Fennel is good for digestion and it has good nutrition value containing B vitamins, calcium, vitamin C, antioxidants, and carotenoids. It also has anti-inflammatory compounds. Pecans contain more than 19 vitamins and minerals and are especially rich in one form of vitamin E called gamma-tocopherols. One study showed that after eating pecans, gamma-tocopherol levels in the body doubled and unhealthy oxidation of LDL (bad) cholesterol in the blood decreased by as much as 33 percent. Save out a few sections of the oranges and squeeze the juice out of them. Toss the slivered fennel with the remaining oranges, fennel tops, and the juice (a little olive oil may also be used, if desired). Place on a bed of lettuce. Top with the raw pecans and the cranberries. Drizzle with balsamic vinegar. Delicious! Are you reminiscing over the pumpkin pie you had over Thanksgiving? Guess what? You can make a rendition that is healthy and delicious! This is a recipe you have to try and perhaps serve at a holiday gathering! The recipe is from The Peaceful Palate by Jennifer Raymond. Combine agar and soymilk in a saucepan. Allow them to stand for 5 minutes. Bring them to a simmer over medium heat and cook for 2 minutes, stirring constantly. Stir in the remaining ingredients and mix well. Pour into an unbaked 9″ pie shell. Bake at 375 degrees for 45 minutes. Cool before cutting. Brussels Sprouts for the Holidays! Brussel Sprouts, along with other cabbage-family foods, are high in detoxifying compounds such as sulforaphane. These foods help reduce the risk of cancer and assist in the upregulation of phase II detoxification pathways. This process helps to rid the body of toxic substances including harmful estrogens. 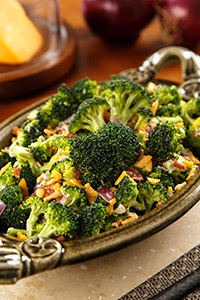 Here is a delicious way to add some of these compounds to a holiday meal. Slicing them and adding a little onion and garlic makes them less strong so the kids will eat them too. 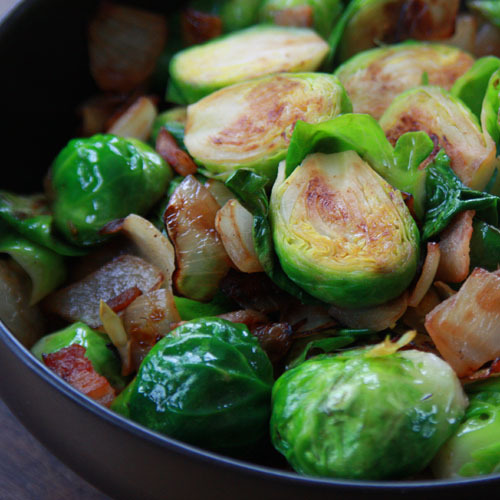 Slice the Brussel sprouts and sauté them with garlic and onion in a small amount of olive or coconut oil. Season with Himalaya or sea salt and pepper as desired. Cook until tender. Serve hot. Thanksgiving will be here in less than a week! Looking for a healthy stuffing recipe? Will you have vegetarian guests? Here are two recipes for you! This recipe is an adaptation of a vegetarian stuffing recipe that appears in The Vegan Handbook in an article by Susan Stafursky. For variety, you can add raisins, substitute nuts for chestnuts, or use different vegetables. Sauté onion, celery, and mushrooms in broth until tender. Add water and bring to a boil. Turn off heat. In a large bowl, combine the Stuffing, cooked brown rice, and roasted chestnuts. Combine both mixtures. Spread into a large, shallow, lightly oiled baking dish. Bake at 400 degrees for 35 minutes or until top and bottom are browned. Serve hot. This recipe is from Vegan Passover Recipes by Chef Nancy Berkoff, RD. The house will smell wonderful while you are baking this dish. Use a selection of winter squashes to create variations. In a large pot, such as a Dutch oven, spray oil and allow to heat. Add farfel, onion, celery, and garlic and allow to sauté for 6 minutes, or until very soft. Add stock, apricots, and cashews (optional) and allow to simmer for 12 minutes, or until mixture is thickened. Stir in parsley and pepper. Remove squash from oven, turn upright and allow to cool for 5 minutes. Fill each squash half with stuffing. Bake for 50 minutes or until squash is soft (easily pierced with a knife). Serve an entire half for an entree portion or one quarter for an appetizer portion.